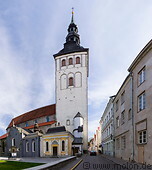 The church of St Nicholas was originally built in the 13th century and restored after the partial destruction due to the World War II Soviet bombing of Tallinn. The Alexander Nevski Russian orthodox cathedral is located on Toompea hill and was built between 1894 and 1900. The St Olav (or Olaf) church is located in the historic centre of Tallinn and dates back to the 12th century. The Charles church (Kaarli kirik) is a Lutheran church built between 1862 and 1870. 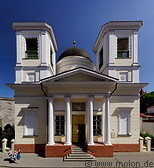 The St Nicholas Russian orthodox church is located in Vene street in the old town and was built between 1820 and 1827. It has twin bell towers and a copper dome.